In the Bible, growth is presumed because it is the nature of God’s creation. What God creates grows. It is a characteristic of creation. Growth is also a characteristic of God’s people (Job. 8:7; Psa. 1; 92:12; 2 Cor. 3:18). At least it is supposed to be. This is revealed more clearly when we consider all the terms and activities that pertain to the Christian: discipleship, nurture, change, learning, etc. We all begin our spiritual life as infants in Christ. But one evidence of true, spiritual vitality is a desire for God’s Word. This is a desire that craves the Word like infants crave milk (1 Peter 2:2). As we satisfy those spiritual cravings with God’s milk we mature to the point where we want more substantial food. This shows we are growing with respect to salvation. So, the bottom line is this: at a minimum, God’s people are supposed to grow up. How much greater the requirement for godly leaders! What’s more, one of the common and significant traits of all leaders is that they are nearly always growing. To be a leader, it is necessary that you grow! Normally a person grows mentally, physically, emotionally, socially, etc. This kind of growth can be “accidental.” In other words, it just happens in the normal course of time. After a while, one must make a conscious decision to mature any further. Should I finish school? Should I go on to college or pursue advanced degrees? Should I exercise and do strength building? Should I become more disciplined in life, become more competent in my field of interest, advance in my line of work, and so forth. So, at some point growth and maturity is a choice. If you are a church leader serving in Christ’s church, it is critical and imperative that you aim for Christ-likeness, and that means growing and maturing with intentionality. This kind of growth is necessary, required, and commanded. But it is also a choice. A genuine godly leader will grow; maybe not consistently and in every way, but he will seek to make progress, discipline himself toward the ultimate goal of becoming complete in Jesus Christ so as to serve fully as a model to others, and as one equipped to serve others. In an effort to understand and get a picture of what a genuine leader looks like we will use the acronym LEADER to examine some things good leaders do. People are more inclined to follow those who hear them and their ideas and opinions. Increased undermining in organizations and families takes place where this is lacking. Wise leaders realize they do not have to agree with everything they hear, but if they don’t take the time to genuinely listen others are not likely to agree with anything they want to do. Good leaders work on developing their listening skills. New ideas, dreams and hopes for progress and advancement are very important in any organization. Developing and sharing their vision with others is a must if the vision is to be accepted and acted upon. Leaders provide the vision and they get others on board to help map out the way to see the vision become a reality. Keeping an idea or thought to yourself that requires others’ assistance is a sure way to keep it from happening! Asking others to help or join you is a hallmark of leadership. Good leaders are not “loners.” Real leaders have a manner of asking for advice and asking for help that is hard to turn down because those who are being asked receive a sense of importance. Wise leaders know when and how to delegate. Frustration may often arise when a person is given responsibility but little or no authority. Wise leaders delegate and empower people with responsibility and authority for the task(s). 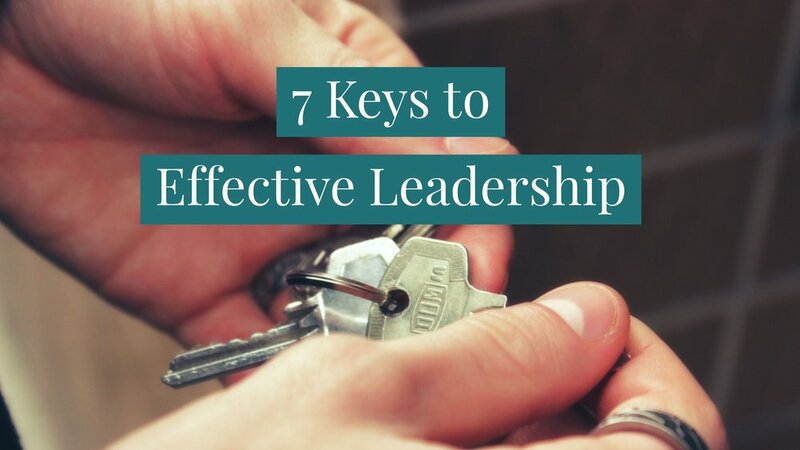 Good leaders are secure enough to overcome the “I can do it better” syndrome and wisely delegate in a way that encourages and develops others. Leaders help other people to be successful. They are not held back by jealousy or thoughts of who is getting the credit. The leader’s focus is on seeing the vision happen and setting the tempo by their example. Often times we will see leaders who appear to be gruff, domineering, and short tempered with people. Yet they are still able to get results. Why? Because they care for and respect people. It is like a football coach who is demanding and somewhat dictatorial in his coaching style and the players and team will battle for him all the way. How does a wise leader make godly decisions? Specifically, how does a wise Christian leader make godly decisions? God wants his people to be humble and to approach him humbly. He wants us to realize that we must consider who we are before him and recognize what our abilities truly are. Even when we think everything is right, trusting in our ways or methods will fail. Your primary priority is your relationship with God. (2) What gives the greatest return? (3) What will be the reward? Make level paths for your feet and take only ways that are firm. Do not swerve to the right or to the left. Keep your foot from evil. Pursue realistic courses or options, and pursue those paths that seem to be firm. Don’t be distracted by wrong goals, motives, or pursuits. Are any of my options unrealistic? Is my heart’s motive pure in this? Will this choice further my relationship with the Lord or hinder it? Which choice will give God the greater glory, if any? Do any of my options violate Scripture? Look to those who can offer sound advice (biblical, with common sense, etc.) and give guidance, such as those who have gone through a similar experience and learned from it (Eccles. 5:1-7; 9:17-18). However, as one pastor warned, do not make your decision on the basis of the experience of others! It is absolutely impossible for you to know all the hidden variables that entered into their circumstances and decisions. This is not meant to invalidate their counsel but to avoid the trap of assuming that other’s experiences are a suitable model for your decisions (2 Cor. 10:12; Eccles. 7:10). The best advice, of course, is from the Lord. Seek him through prayer and ask for his guidance (Matt. 7:7-11; 21:21-22; John 14:14; 15:7; Phil. 4:6-7; Col. 3:17). What does God say from his Word about the question(s) at hand? Who do I know that can offer straightforward advice? What wise elders can I seek out who can make some wise suggestions or give insight? Principle: I am willing to consider the advice I have been given, and will listen intently, even when it goes against what I want. Am I seeking the advice of others in order to find someone who will give me what I want to hear? Am I listening intently to the advice of others and seriously considering what they have to offer? Am I listening intently to the advice of Scripture and the Holy Spirit? Am I willing to take risks or make changes if this is God’s will for my life? A person who lacks judgment enjoys his foolishness, but one who is filled with understanding keeps a straight course (Proverbs 15:21). Principle: Bliss or feeling happy about something doesn’t make a decision right. Being a biblically wise person (seeking to think God’s thoughts after Him) will help me keep a good course of direction in a diligent manner. Wavering is a pleasure for the fool. Do I find more comfort and security in not making decisions than in making one? Am I seeking to think God’s thoughts about this matter? Have I searched the Scriptures to see if there is anything that speaks to these issue(s)? 3. It is wrong to have a mind that nearly always wavers back and forth, or is indecisive. This is especially true of a leader. Leaders who cannot make decisions are not leaders at all (Rom. 14:5; James 1:5-8; 5:12). Does it separate me from sin and evil? Does it promote moral holiness? That is, does it promote peace? This does not mean that just because you feel peaceful about the decision then it is a right decision. The emotion of peace can mean that you are relieved that you have found the means to shirk responsibility. It can mean that you have found a way to absolve you for doing something you did not want to do. It could mean that you are pleased you have decided to do something you wanted, but your conscience has been seared sufficiently enough to repel any conviction about a bad or sinful decision. Is it gentle (forbearing, considerate)? Is it reasonable (willing to yield)? (2) List all of the pros and cons as you can possibly think of. (4) Put the list away and take time to pray for guidance and wisdom. (6) Now throw all of your “C’s” away and consider only what you have left. Is it full of mercy or compassion? Is it something that will produce good fruit? Will you get a good return, is it of value or profitable (not necessarily in terms of monetary rewards)? Is it without favoritism or prejudice? Is it genuine, sincere or without hypocrisy? Many are the plans in a man’s heart, but it is the Lord’s purpose that prevails (16:33; 19:21). Principle: No matter how hard I plan to do things, ultimately it is God’s Sovereign plan for my life that succeeds. A wise leader will recognize God’s authority, presence, and power in everything. He will understand that only God can bless anything and everything at all (Psa. 37:4-5; Matt. 6:19-34; Jn. 8:31-36; 15:1-7; Phil. 4:6-7; Col. 3:17; James 1:5-8). Have I purposed in my heart not to worry, but rather to give thanks for the process and for the outcome? Have I made the commitment to do what is right before the Lord? 3. There is great counsel and sound wisdom in God and His Word. Seeking His wisdom is understanding and great power for success (Proverbs 8:14). The principle here is - Success is always linked to godly wisdom and good counsel. The person who plans well will win.